TORONTO, ON – November 28, 2018 – Winter is coming, and thanks to the 2019 Prius, with available new AWD-e system, there’s no need to fear it. Go further and explore more with confidence and control, no matter what the weather and road conditions are. Designed to provide more confidence and control when weather and road conditions are less than ideal, the electric all-wheel drive system further expands where the Prius can take drivers. The new Prius AWD-e system will certainly deliver added traction and confidence for drivers but, in true Prius fashion, the 2019 AWD-e will lay claim to being one of the most fuel-efficient all-wheel-drive-equipped passenger cars available in Canada thanks to manufacturer-projected fuel consumptions of 4.5 / 4.9 / 4.7 L/100 km (city/highway/combined). Toyota estimates that the AWD-e model could account for as much as 65 percent of annual Canadian Prius sales. Toyota’s AWD-e system is ideal for Prius. The automatic on-demand system does not require a centre differential or other torque-apportioning device, nor does it need a front-to-rear driveshaft. Instead, the “e” in AWD-e stands for electric. The Prius AWD-e uses an independent electric, magnet-less rear motor (a Toyota first) to power the rear wheels from 0 to 10 km/h, then when needed, up to 70 km/h. This system provides the power to the rear wheels to pull away from a stop, yet the on-demand system recognizes when all-wheel-drive performance is not needed to provide great fuel economy. The addition of the available AWD-e system is only part of the wider revision to the 2019 Prius, which debuts newly refined front and rear exterior styling, along with additional interior updates. Let’s not forget that the front-wheel-drive (FWD) Prius will still offer the impressive fuel economy for which it is known, with manufacturer-projected fuel consumptions of 4.4 / 4.6 / 4.4 L/100 km (city/highway/combined). The 2019 Prius FWD will be available with Base and Technology grades, while the AWD-e model will be offered in Base, Technology and Technology with Advanced package grades. Prius will also sport two new colours for 2019, Supersonic Red and Electric Storm Blue. The AWD-e models use a newly developed compact Nickel-Metal Hydride (Ni-MH) battery that is designed to provide excellent performance in cold-weather conditions. The AWD-e battery fits under the rear seat area and does not impact the luggage capacity. The FWD models will tout a Lithium Ion battery. The Prius AWD-e models offer the same 1,855 L of carrying space with the standard 60:40 split rear seatbacks lowered as other Prius models. That’s more than in some small SUVs and larger than most full-size sedans. Expanding carrying options, the Prius AWD-e will offer available Genuine Toyota Accessory cargo crossbars for roof rack attachments, such as for carrying bikes, kayaks, snowboards, or a cargo carrier. The Prius AWD-e Technology features upgraded SofTex-trimmed and heated front seats. The SofTex-trimmed heated tilt/telescopic steering wheel on Technology grades features surface temperature-regulating properties to help make it feel more comfortable in hot or cold weather. The steering wheel also integrates switches for the audio system, Multi-Information Display, and Bluetooth hands-free phone controls. The Prius comes standard with heated front seats, driver’s door Smart Key System, Push Button Start and remote illuminated entry. The Technology grades include Standard Smart Key System on three doors (driver, passenger and hatch). An Adaptive Front Lighting System is standard on the Technology with Advanced package grade. All Prius models share interior features including the familiar central screen interface. The 4.2" colour Dual Multi-Information Display with customizable screens adds an AWD-e system indicator to the menu of displays, which also includes Energy Monitor, Hybrid System Indicator and Eco Score, Eco Savings Record, Drive Monitor, Eco Wallet, Eco Diary, Climate Control, driver support systems, audio system content, and navigation system content. For the ultimate in high-tech information, the available (in the Advanced package) Colour Head-Up Display (HUD) shows the speedometer, navigation, and Hybrid System Indicator in the driver’s line of sight. The standard audio system for AWD-e models includes a 6.1 in. touch-screen display, AM/FM CD player, 6 speakers, auxiliary audio jack, one USB 2.0 port with iPod connectivity and two 2.1-amp USB charge ports, advanced voice recognition, Bluetooth hands-free phone capability, phone book access and music streaming, Siri Eyes Free, and an integrated backup camera display. The Technology with Advanced Package grade comes standard with a large 11.6” HD multimedia display. 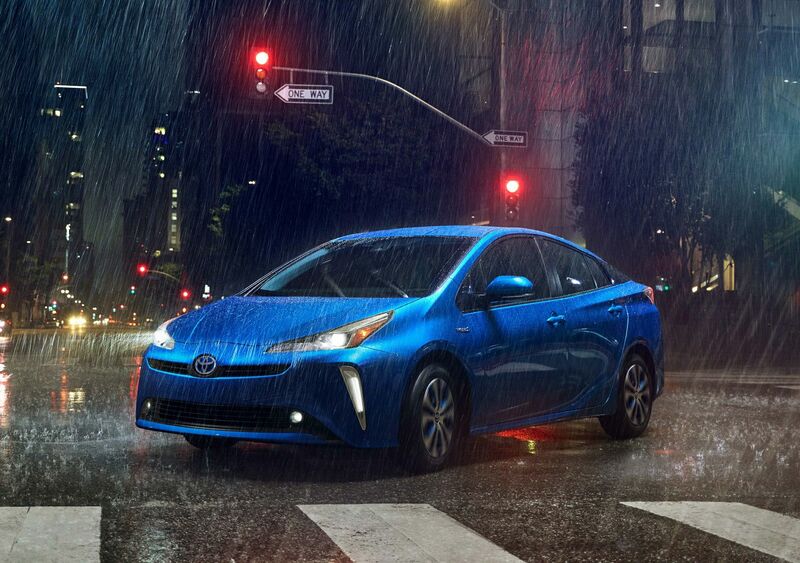 The Prius AWD-e shares the Hybrid Synergy Drive system with other Prius models. The system combines the output of a 1.8-litre 4-cylinder gasoline engine and two motor/generators through an electronically controlled planetary-type continuously variable transmission (CVT). The Electronically Controlled Brake System coordinates control between the regenerative braking and the vehicle’s hydraulic brake force to provide optimal brake performance and feel. The 2ZR-FXE 1.8-litre 4-cylinder gasoline engine is itself a paragon of high efficiency. Thanks to ultra-low internal friction and efficient combustion, it exceeds 40 percent thermal efficiency, which is among the highest in the world for a gasoline engine. The fourth-generation Prius is built around the Toyota New Global Architecture (TNGA). The platform introduced a new high-strength body structure, multi-link rear suspension and a lower centre of gravity. The result for the Prius is a highly engaging driving experience combined with exemplary ride smoothness and a quiet cabin. The 2019 Prius will go on sale in Canada in the Spring of 2019.